If you have recently invested time, effort and money in a beautiful natural stone patio or some gorgeous flagstones, it would be a wise move to think about protecting your investment with a patio sealer. A good quality paving slab sealant will not only prevent against moss and algae buildup, but it will make the process of cleaning your stone paving far easier in the future. Our patio sealers are suitable for all types of paving, including: indian sandstone, block paving and stone flooring. 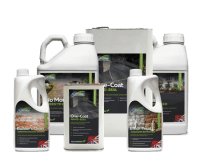 Products are available in both 5 litre and 25 litre quantities, and a variety of surface finishes. 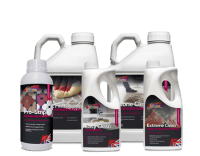 Universeal are a leading specialist manufacturer of superior grade stone care formulations in the UK. Our products are used extensively by professionals across the country and discerning homeowners choose our product range for the best achievable results. We often get asked, “how do I seal my patio?” or “what’s the best patio sealer” and whilst we have a FAQ section and a helpful expert guide on our website, we thought it would be a good idea to cover some of the most important pointers for professional patio sealing in this quick blog post. When should I seal my Patio? There are many confusing myths about when you should seal and protect your stone patio or natural paving area. We have heard of people saying you should wait up to 6 months before sealing your patio to allow time for the natural salts and minerals to come out of the stone. If you ever get told or hear this then please definitely ignore. High grade modern sealers are breathable and allow the stone to completely dry out without trapping the natural salts and minerals within the natural stone. 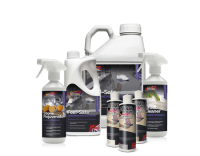 This vapour transmission is critical to rapid patio sealing post installation and the majority of Universeal Sealers are 100% breathable. So to avoid surface soiling and even worse permanent staining it is important to seal your stone as soon as possible. What type of look and finish can you achieve with modern patio sealants? Deciding on your patio sealer desired finish requires some consideration.  There are many different choices of sealers on the market. Generally the more expensive the product, the stronger and longer it will offer surface protection. It is important to correctly choose the desired finish for your patio. If you are unsure, then always do a small test patch on some loose tiles or small, inconspicuous area before starting with the application. Once applied it can be very difficult or sometimes impossible to reverse the effects of a patio stone sealer. Once you have chosen and purchased your sealer, it is very important to make sure thorough preparation is carried out before applying the sealer to your stone slabs. If freshly laid, make sure the patio area is completely clean, dry and free from debris and surface staining. You don’t want to seal any stains or marks in with the sealer as it will be almost impossible to remove after application. A common problem can be staining from the grout or pointing, it is not unusual for this process to cause staining to the surface of the stone or around the edges of the stone where the jointing sand has been applied and not thoroughly washed off. If you notice this problem, then it is important to remove these stains before applying any sealer. This can be done with Universeal Builders Clean but only if the stone is not acid sensitive. If you are unsure you can contact our technical helpline 01300 345898 ext2 or check with your local Stone Merchant for more information. Always sweep away any loose surface coverings such as leaves, soil, stones, etc. We recommend using a wide, stiff outdoor brush for cleaning up. If there is a large degree of wet, stuck-on mud and vegetation, it will be of benefit to wash this away too, hose and broom should do a good job or a quick blast with a pressure washer if close to hand. 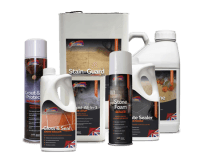 Then apply a good quality, professional grade patio cleaner, our New Clean 60 Patio Cleaner is one if the leading formulations available on the market and can deliver stunning results, often bringing your natural stone back to good as new condition. For detailed instructions on cleaning dirt and grime, mould and algae from stone patios, read our expert guide to patio cleaning. Now you are ready to start sealing, we have a few important tips to achieve a professional finish. Firstly check the weather forecast for any rain, most modern sealers need to be applied to a completely dry surface and stay dry for up to 72 hours, always check the product label for specific cure times. It is also important to work within temperatures of 5°c – 20°c; applying sealers in conditions outside these parameters could cause issues with the sealer application, appearance and performance. The majority of modern sealers are safe solvent free/ water based formulas, but occasionally it is necessary to use a solvent based product. Please be mindful that personal protection in very important, it may be necessary to wear protective clothing, gloves and eyewear, always check the specific product label before use. In case of overspray, spills or splashes it is important to check the surrounding area for sensitive surfaces, young children and pets prior to starting the project. You should consider masking adjacent surfaces such as wooden decking, plastic or artificial flooring materials before starting work. Having the correct tools will make the product easy to apply and yield a superior result. Although many application tool types can be used, e.g. brush, roller, lint free cloth etc. Where suitable we strongly recommend a spray application. A simple garden sprayer can be used, this allows for far quicker and even application of your chosen paving sealer. To aid with this type of application, we suggest having a clean soft brush on hand to evenly distribute any sealer that has been applied inconsistently with the sprayer. As mentioned in tip 3, if your patio is not a new install then some cleaning and remedial repairs may be necessary prior to sealing and protecting your patio. Above and beyond cleaning, for truly professional results, we recommend you check for cracked tiles, or loose pointing. Replace or repair these areas first before thoroughly cleaning and then sealing the area. Modern water-based sealers have the added bonus of acting as consolidation for newly laid or repaired pointing and grout. Take your time with the sealing project and follow the guidelines carefully. Consider the type of stone you are sealing. Surface coverage will vary depending on the stone’s texture and porosity. Always apply the first coat generously and evenly. If you are using an impregnating sealer then the sealer needs to penetrate into the stone surface within 15-20 minutes maximum. avoid any sticky patches or hard to remove white marks drying on the surface. Follow the instructions given on the product label regarding curing times for the second coat. This can vary considerably depending on whether you opt for a top coat sealer or an impregnating sealer. Be aware of the potential risks to the lifespan of the sealed surface. Heavy footfall, mechanical abrasion and harsh, acidic or alkaline cleaning formulas can all negatively impact the longevity of the protected surface. For regular, low impact cleaning, we recommend you use clean water supplemented by an occasional treatment with a very weak dilution of either our New Clean 60 Patio Cleaner or ph Neutral Stone Cleaner. Avoid using mechanical abrasion machinery as this will damage the polymer matrix of the sealer. If you follow these 8 tips, you will be much more likely to get a professional end result and enjoy a longer lifespan of the protective seal. Should you need more guidance or some technical details, please get in touch using our contact form or call the technical line on 01300 345898 etc.